Adapting a literary classic is treacherous territory. Not only is there the threat of certain elements that made the original so widely acclaimed being left out, but also that it might miss the purpose of the novel entirely. Luckily for Oscar-winning filmmaker Andrea Arnold, her take on Emily Brontë’s revered Wuthering Heights retains its distinctive quality. Nevertheless, she heralds a new, modern life for the author’s old-fashioned ideals: in particular through her choice to alter Heathcliff’s race, intensifying the themes of race and class difference which were relatively concealed throughout the source material. By stripping the narrative back to its bare bones, the screenplay – penned by Arnold and Olivia Hetreed – forces the fraught relationship between Cathy, a farmer’s daughter, and Heathcliff, a lowly traveller taken in by Cathy’s charitable father, Mr. Earnshaw, to the forefront, letting the unnecessary padding fall to the wayside. It’s a bold move that succeeds superlatively to create something absorbing from the outset, predominantly due to Arnold’s resolute ambition and expertise in formulating believable, natural relationships between her characters – something she has built on from achievements made in both Red Road and Fish Tank. That said, perhaps the main reason Arnold’s version comes as such a welcome, exalted interpretation of Brontë’s words can be attributed to cinematographer Robbie Ryan’s ability to convey much of the unsaid, unconsummated devotion between Cathy and Heathcliff. Long, lingering takes, inventive camera techniques and a freeness achieved only by the implementation of a roving handheld camera explore their connection through the boundless landscape that surrounds them. Not only are their everyday lives heavily rooted in the vulnerable, barren environment, but it’s also reflective of their tempestuous relationship, open to all manner of emotions: hurt, betrayal, devotion, lust, desire and, paramount, dependency. With the overwhelming, persistent focus placed upon newcomers Shannon Beer and Solomon Glave, the younger incarnations of Cathy and Heathcliff, they demonstrate their inherent talent in remarkably composed fashion considering their innocence. Even James Howson as the older version of Heathcliff delivers a stalwart if trivial turn. Arnold has once again succeeded in plucking inexperienced actors and turning them into promising stars, precisely like she did with Katie Jarvis in Fish Tank. It’s a shame, then, that the more experienced actors, namely Kaya Scodelario as the older version of Cathy and Nichola Burley as Isabella Linton, let the side down with their substandard, emotionally lukewarm performances. 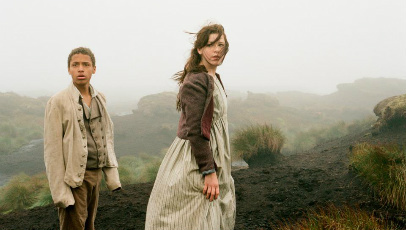 Aside from a couple of inferior performances, a weighty final act and a prolonged running time, Wuthering Heights is something of a rarity: an interpretation of a literary classic that adds a new dimension and crux to a straightforward, if intense, love story. Arnold has pioneered a pronounced, austere, earnest and visually striking treasure of British cinema, indebted to Beer and Glave’s impressive debuts.